Holistic Health & Lifestyle Coaching Services— A winter soup to keep the whole gang happy! I don’t know about you guys, but soups and stews are my JAM as soon as the temperature drops. Not only are they warming, delicious and packed with nutrients, they are also a great freezer meal. Soups/stews are great to batch cook and then freeze; you always have something on hand. This is what I call SMART MEAL PLANNING! A great way to avoid the “I don’t have anything to eat, guess i’ll order takeout” dilemma or the “I think I’m getting a cold, sniff, sniff, sniff”. I create soup recipes on the fly all the time, they aren’t really as challenging as some may think. Sure there’s some great pre-made soups on the market, you’ll find these in your more natural, local grocery stores; however they can be quite pricey if you want simple, real ingredients and not just a can of Campbell’s tomato soup. “But I love my Campbell’s Miya!”. Okay fair, I once did too, alongside a grilled cheese sammy. Unfortunately, those canned soups are just SWIMMING in sodium, like triple the recommended daily intake LOL; plus a whack of other not so fabulous ingredients. The GOOD NEWS, you can easily make your own and it’ll taste amazing. A week ago I make an impromptu soup with some extra carrots and ginger that I had lying around. It turned out to be a real winner! The soup came to be a nutrient dense, immune boosting concoction. Perfect for the cold weather and cold/flu season. At this time of the year, you really want to be doing everything in your power to keep your immune system running; if you prefer to be out having fun that is. This soup has added immune boosting and anti-inflammatory benefits from the fresh ginger and turmeric, as well as healthy fats from the coconut cream and oil. The food you eat is an easy first step towards feeling your best! 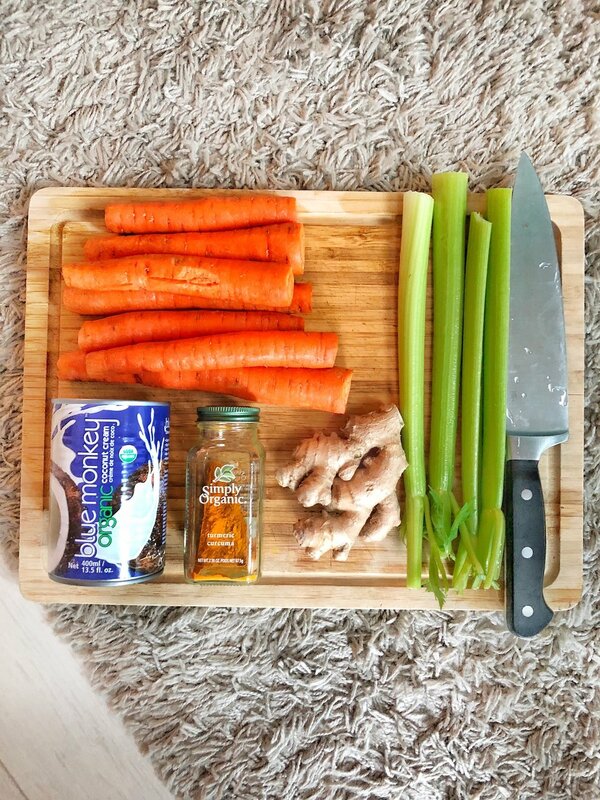 Enough babbling, I’ll end off this short post with that delicious carrot, coconut & ginger soup recipe! It’s vegan if you choose veggie broth, dairy-free + gluten-free. Heat coconut oil over medium in a soup pot. Add the onion and garlic, sauté for 5 min or so, or until the onion begins to turn translucent. Do not burn the garlic, lower heat if necessary. Add in the ginger, turmeric and pepper, sauté for a minute. Add in the carrots and celery and sauté for about 10 min or so. Add in all liquids, season with sea salt and pepper. Bring up to a boil. Turn down heat and let simmer until the carrots are soft; you should be able to put a fork through them so that they can be easily puréed. Take the soup off the heat and let cool for a few minutes. Add to a high speed blender or use an immersion blender and purée the soup until smooth. If you are saving the soup for later, let it completely cool and store in airtight containers in the freezer (for longer durations) or in the fridge (I like to use mason jars for fridge storage). For more winter recipes, check out my eBooks page! *Don’t forget to drop me a comment below if you try the recipe or have any questions!